Trying to find pubs in Blackmore End? You’ve come to the right place. We’ve got every pub and bar in the UK listed. Whether you’re looking for a pub or bar in Blackmore End to play darts, somewhere to play pool or just want to have a look at a menu before you go, we can help. 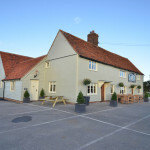 The Bull at Blackmore End has been lovingly transformed after being closed for 3 years. Focussing on serving fantastic beer, amazing food, all accompanied by great service from our knowledgeable staff. 16/03/2014 Terrible meal,bad service and very expensive! 31/01/2014 Great food, service and drink! 30/01/2014 You won't be dissapointed.